Click the Photo Above to See All Photos of This Bridge! In 1879, the Northern Pacific Railroad continued building west from Bismarck. 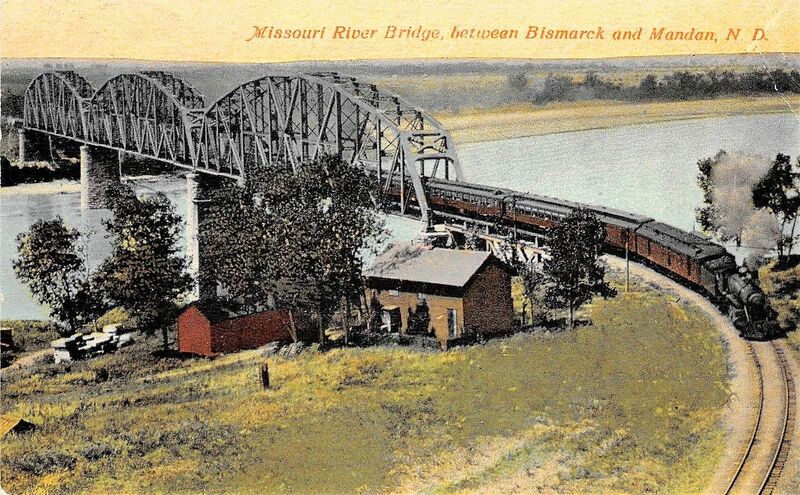 A new 292 mile line to Fort Keough, Montana by the end of 1881, with the bridge across the Missouri River connecting Bismarck to Mandan opening the next year. This new route formed the basis for an expansion to the Pacific Ocean by Northern Pacific. To the east, the route connected to St. Paul, Minnesota. Inevitably, the route would reach the west coast a few years later. The route stayed under the same ownership from the time of its construction, until Northern Pacific merged with Great Northern and Chicago, Burlington & Quincy in 1970 to form Burlington Northern, a railroad with thousands of miles of trackage connecting Chicago to the Pacific Ocean along three different corridors. BN remained the owner of this route for many years, until they themselves merged with Atchison, Topeka & Santa Fe to form BNSF Railway, the current owner of this line. BNSF continues to operate this as a mainline, and it is known as the Dickinson Subdivision. 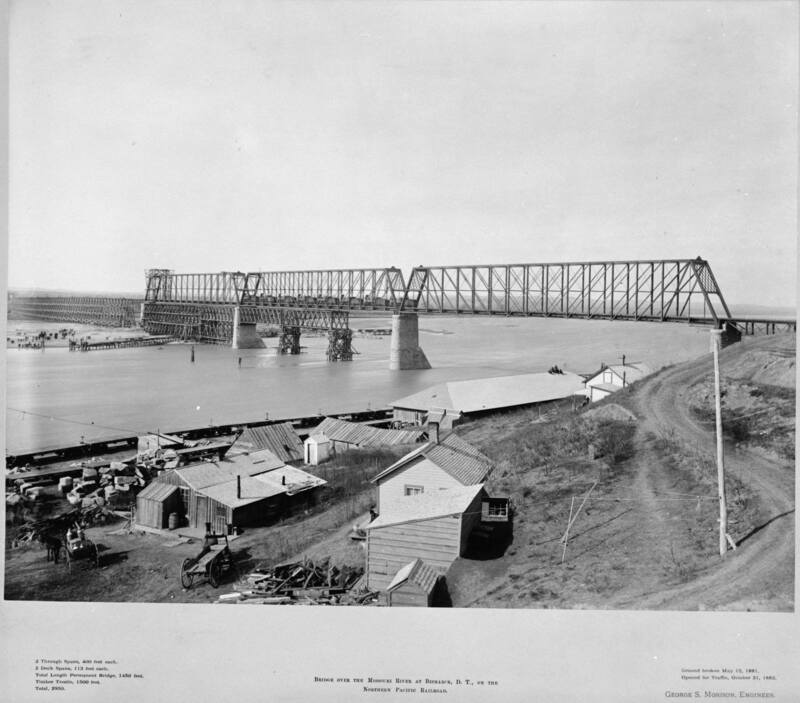 The largest railroad bridge in North Dakota is this massive and impressive through truss bridge connecting Bismarck to Mandan. Originally built in 1882 as a Whipple Truss, those spans were scrapped and replaced with the current bridge in 1906. The current main spans of the bridge are massive, 400 foot long Pennsylvania Through Truss spans. In addition, these spans contain 14 panels each and pinned connections. Approaching the bridge from the west is a single short Warren Deck Truss span. This span contains riveted connections. In addition, a series of modular concrete beam spans approach the bridge from the east. Built reusing 1882 stone piers, the bridge towers approximately 110 feet above the Missouri River. The approaches all use newer concrete substructures. 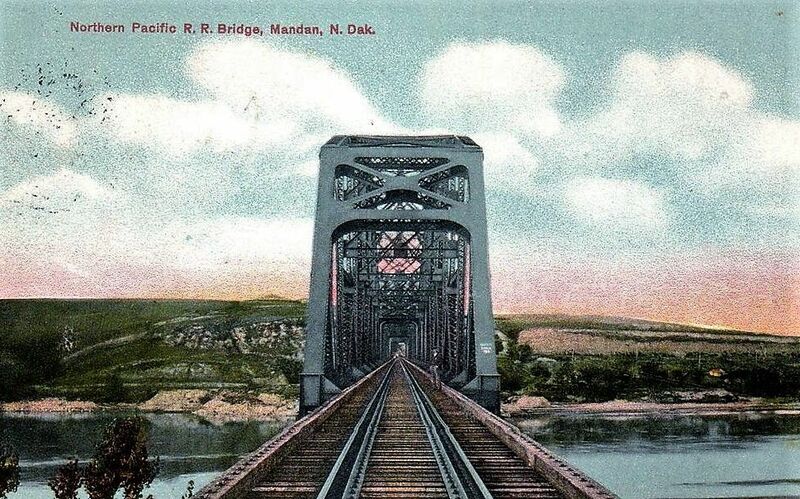 The east end of this bridge has always been a cause for concern for the railroad. In addition to a tight curve immediately after the bridge, the east approach has had a long history of shifting. When first built in 1882, the eastern pier began moving towards the river at approximately 3 inches per year. After being rebuilt in 1898, the pier was 4 inches off center again in 1902. Later rebuilds in 1918, 1923 and 1940 tried to slow down the landslide, now believed to be caused by a water reservoir on the above hill. In 1951, after more shifting, the approach was rebuilt again and the sliding ceased to less than an inch per year. By 2005, BNSF was sick of the constant shifting of the bridge. They replaced the riveted Warren Deck Truss span with the modern concrete beams seen today. Overall, the bridge remains in good condition for the age. While BNSF has proposed replacing the bridge with a parallel structure and demolishing the current bridge, turning the old bridge to a trail should be feasible with the current condition of the bridge. The author has ranked this bridge as being high significant, due to the lack of large bridges in North Dakota. Unlike South Dakota, North Dakota only has a handful of railroad trusses surviving in the state. From this, it follows that demolition of this bridge would be a great loss to the collection of historic bridges in North Dakota. On the local level, the bridge is a landmark. Proposals have been brought by numerous citizens and agencies to preserve the bridge as a future greenway. However, BNSF has not yet agreed to this. BNSF has their own concerns, including right-of-way and security for a new bridge. While BNSF never stated that they would not agree to this, it is clear that they did not plan on such a public outcry. The author responds to these concerns, by suggesting that building an upstream bridge should be feasible, as the railroad owns a significant amount of land around the existing structure. In addition, this would reduce the sharpness of the curve on the eastern end. As to the security concern, the author believes that if the old bridge is converted to a trail, more than likely pedestrians would use the old bridge. However, with the nearest pedestrian crossings of the Missouri River being nearly a mile away, failure to convert this bridge to trail usage would likely see pedestrians crossing the new bridge. In addition, this should be a no brainier for BNSF. While there are additional constraints with keeping the old bridge, the public image of demolishing the old bridge would be extremely negative. A petition has been created, asking BNSF to preserve the old bridge. The author asks that everyone reading this page gives this petition a signature. The photo above is an overview of the bridge. The photo below is an example of the bridges massive stone piers.